The 300 Series offers a class-leading combination of power and torque, improved fuel efficiency, an impressive suite of safety features including Vehicle Stability Control (VSC) (an Australian first on light-duty trucks), and options like a true clutchless automatic transmission, rear view parking cameras and a truck-specific satellite navigation system. With 67 models in total – including eight hybrid models, standard and wide cab variants, and the built-to-go SteelAce, TradeAce, WorkAce and Tipper range – Hino has a 300 Series light duty truck to suit your needs. 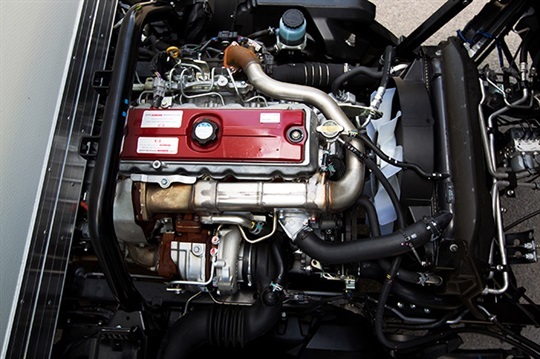 Meeting both strict Euro 5 and Enhanced Environmentally-Friendly Vehicle (EEV) emissions standards, the new model’s gains in power, torque and fuel efficiency have been achieved through careful attention to engine design, turbocharger pressures and the high-pressure (common-rail) electronic fuel injection. Injection pressures have been increased and a new intercooler adopted, and the Hino engine has the added reliability of three fuel filters. Cabin entry and exit on the new 300 Series has been improved with larger, class-leading door apertures, wider opening doors, larger steps, increased foot and leg space, and even a collapsible gearshift lever to allow the driver to slide more easily across to the passenger side if required. 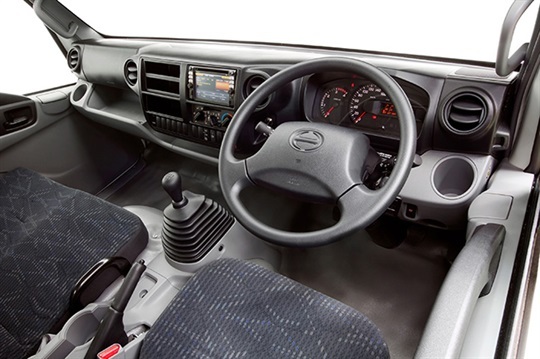 Driver comfort has been maximised by adopting a tilt and telescopic-adjustable steering column, and providing a greater range of seat adjustment to allow drivers of all heights to better tailor the seat position to their needs. 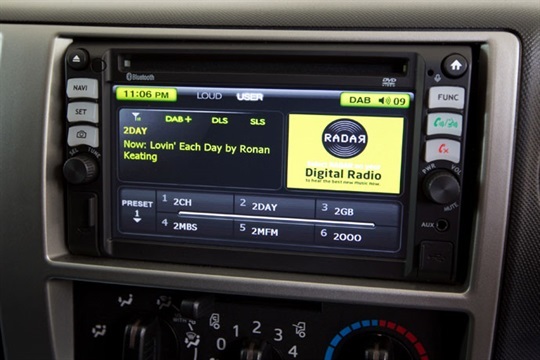 Hino Australia was the first vehicle manufacturer in the world to include a digital audio broadcast (DAB+) multimedia unit as standard equipment across its range of trucks. Hino's state-of-the-art multimedia unit features a large 6.1-inch high-definition touch-screen, DAB+ digital and conventional AM/FM radio receivers, CD and DVD player, USB and SD input, and is Bluetooth™ enabled. All Hino 300, 500 and 700 Series trucks manufactured from September 2011 onward feature the all-new Australian-designed multimedia unit as factory-fitted standard equipment. A truck's cabin is the primary office for many Hino customers, and the world-first multimedia unit improves the efficiency and safety of their working day. The new in-dash double-din multimedia unit is designed to be user-friendly, feature the latest technology and contribute to vehicle safety with the adoption of rear-view sound-enabled infrared cameras and Bluetooth™ technology. 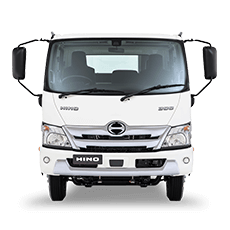 The Hino 300 Series cabin has been equipped with clear-to-read instruments and easy-to-reach controls and switchgear, providing passenger car levels of drivability and safety. All 300 Series variants are equipped with class-leading instruments, which can be read from all angles and in all lighting conditions. 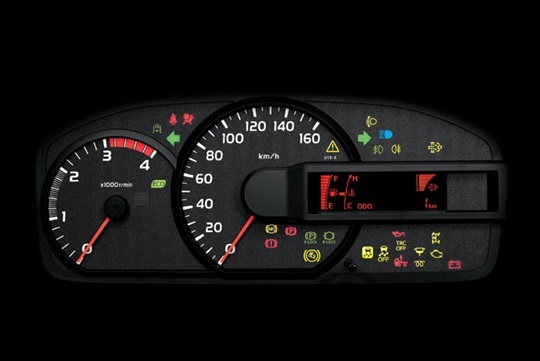 Every model is equipped with a tachometer, speedometer, and full suite of warning gauges and lights. The dash features blank DIN mounting slots (for additional radio equipment) and there are a number of switch mounting holes to cater for accessories that may be added. All models have factory-fitted Denso air conditioning, remote central locking with an integrated engine immobiliser, and power-operated windows and mirrors. Crew Cabin models feature an auxiliary rear air conditioner unit - the only light truck in Australia with these combined features. All manual 300 Series models have Hino’s ES (Easy Start) hill-start assist, which can be switched off using a dash mounted switch. New Hino 300 Series wide cab models are fitted with an ergonomically designed fully-adjustable driver's seat for maximum comfort. 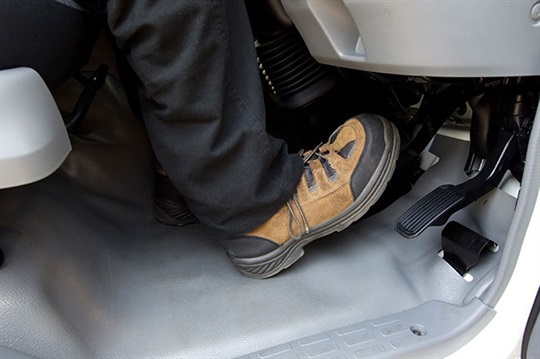 The seat runners are positioned on an incline to better cater for short and taller drivers (a first for any light-duty truck), placing the seat in a better relative position to the trucks pedals. All wide cabin models have a driver's suspension seat with torsion-bar suspension and magnetic dampening with lumbar support, further improving driver comfort, but also reducing fatigue. Hino's seat design provides maximum driver comfort for all road conditions; from smooth roads through to heavily corrugated surfaces. Sets the vehicle to the designated speed, usually resulting in better fuel efficiency. This reduces fatigue in day to day metropolitan haul applications. All Hino diesel-engined 300 Series models come standard with a manual transmission. Standard cabin variants feature Hino's well proven five-speed manual, while wide cabin diesel models have the Hino six-speed manual. Hino’s six-speed manual transmission has synchromesh on first and reverse gears for increased durability and all-round ease of operation. The manual shift lever is also collapsible, to provide slide-across access for the driver or passenger when in tight parking locations. 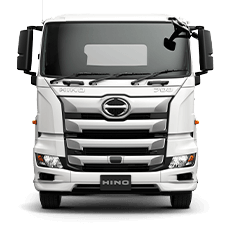 Hino's renowned Easy Start technology is also fitted to all manual models. It electronically maintains braking force, even when the driver takes their foot off the brake pedal allowing the driver to seamlessly move off from a stationary position without rollback on uphill grades. Easy Start operates in both forward and reverse gears. All Hino 300 wide cab diesel models have a sturdy 13-inch clutch to ensure maximum reliability and durability. Hino is the only Japanese truck manufacturer to offer the advantage of a fully automatic transmission in the light-duty truck market. The new Hino 300 Series has the choice of a smooth-shifting fully automatic torque converter transmissions across its 56-model diesel-engined range. The ‘intelligent’ Hino automatic has a fuel-saving torque converter lock-up in five ratios – second to sixth gear. The learning characteristics of the transmission can comfortably adapt to the driving style of the driver, making the Hino automatic perfectly suited to a variety of customers, including rental fleets, and stop-start city use. It has a ‘neutral control’ feature which electronically switches the transmission to neutral when the truck is stationary and the brakes are applied. This reduces engine and drivetrain load, offering significant savings in fuel consumption. The Hino six-speed automatic has a host of electronic control features normally associated with high-end luxury cars. 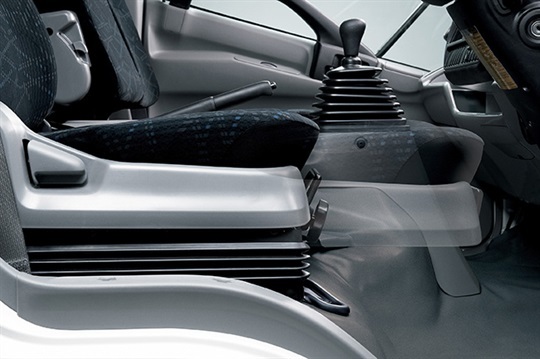 to aid driver comfort, the shift lever is located in the most intuitive position - the centre console. The shift can also be collapsed (to the left, only when the vehicle is stationary) for across-cabin movement by the driver. The Hino Hybrid 300 Series features Hino's ProShift 5 Automated Manual Transmission (AMT). 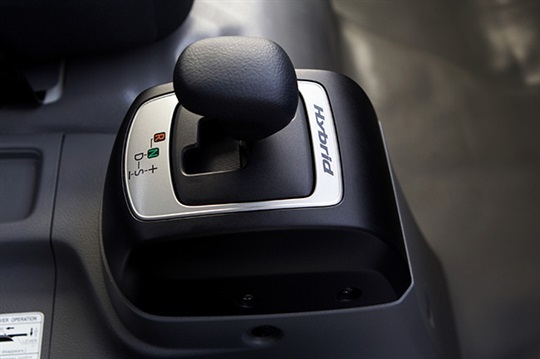 The ProShift 5 AMT employs an electronic control unit to control the changing of gears and operation of the clutch. 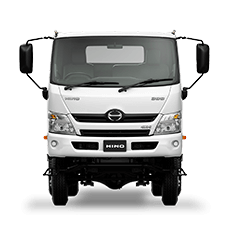 Unlike other AMT equipped light duty trucks the Hino has no clutch - the sophisticated electronics perform all clutching functions allowing easy, two-pedal only operation. When driven in the Drive (D) mode, the vehicle can be driven like a conventional automatic-transmission truck. 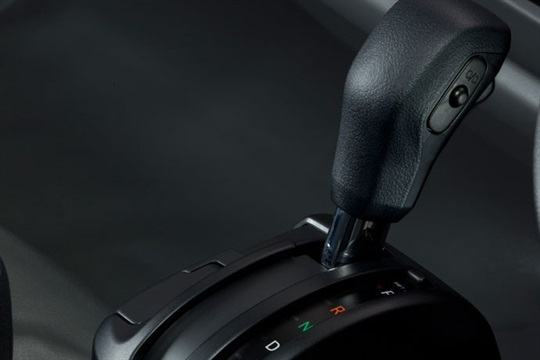 In this mode gear changes are executed in accordance with driving conditions and hybrid system mode settings. 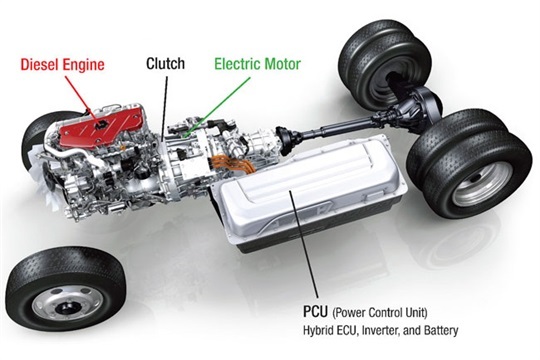 The operation of the hybrid drivetrain is optimised in this mode, contributing to significant fuel consumption savings. 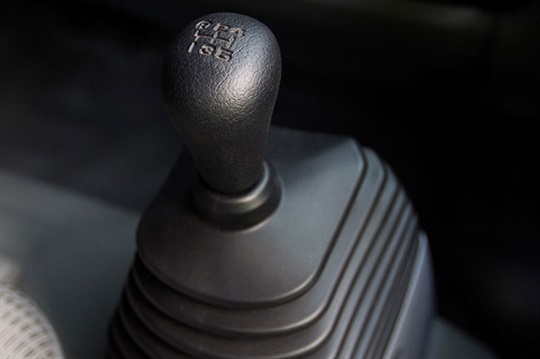 Drivers may also select S (Sequential) mode, should they wish to select gears manually to suit their driving style, or to hold gears in circumstances such as long steep descents (requiring low gear selection). Hino’s ProShift AMT has been designed so that it is easy to drive, requires low maintenance, and provides long service life. 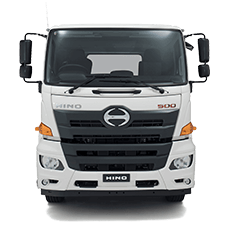 A compulsory safety feature on new passenger vehicles, the new Hino 300 Series is the first light duty truck in Australia to include life-saving Vehicle Stability Control (VSC) as standard equipment. VSC acts as an additional layer of safety by applying selective braking to individual wheels, assisting the driver in maintaining control of the vehicle. It incorporates traction control, and is designed to help prevent the vehicle from skidding out of control should it deviate from the driver's intended path through a corner. It is recognised by experts across the world as being active safety technology that saves lives. The VSC and traction control system can be switched off - to assist in control of the drive wheel traction when the vehicle is in muddy conditions by spinning the drive tyres to clear the tread. 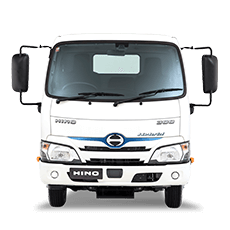 As expected from a truck with such impressive safety credentials, the all new Hino 300 Series light duty truck includes dual front SRS airbags (for both driver and passenger), coupled with emergency locking retracting (ELR) pretensioning seatbelts. Airbag have proven to be an effective safety device over many years, measurably reducing the severity of injuries sustained by vehicle occupants during a severe accident. Airbags are just one aspect of a raft of safety features incorporated in the new 300 Series, creating an unbeatable active and passive safety package. All Hino 300 Series models have four-wheel ventilated disc brakes with ABS braking, electronic brake-force distribution (EBD) and Brake Assist (BA) as standard equipment. Hino was the first manufacturer to offer four-wheel ventilated discs in the light truck market with the launch of the Hino Dutro, and this feature is still unique to Hino. Brake Assist is designed to assist the driver in emergency braking, where the driver is attempting to apply the high pedal force required to obtain the shortest possible braking distance. Together these technologies ensure that maximum stopping power is available, regardless of how the vehicle is laden and the prevailing road conditions.